A week or so back, when I was fitting the fuel tank, I started to have a look at the fuel sender but didn't actually do anything with it, so last week I decided it was time to rectify that and get it fitted as the tank was back out of the car and on the bench waiting supply of fuel line fittings. The sender unit bolts into the top of the fuel tank but as it is a generic item it has to be amended to suit the Cobra tank. 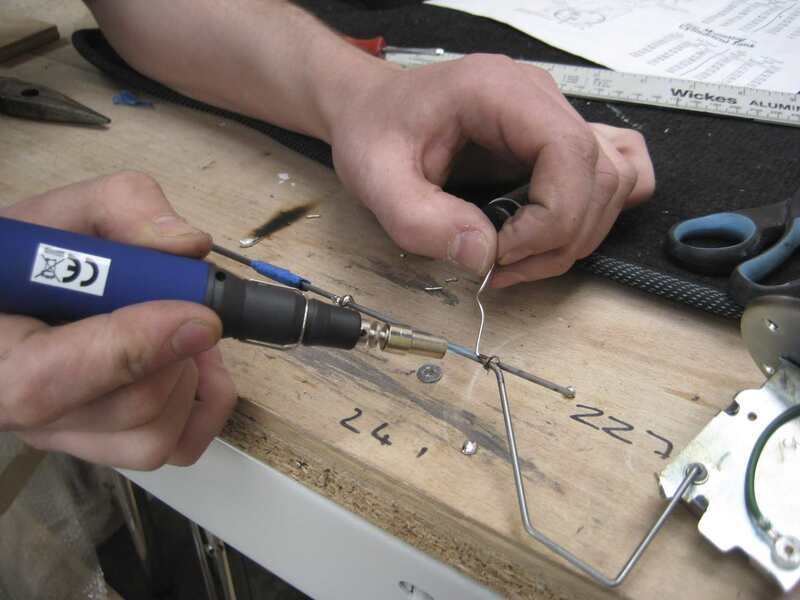 This is a relatively simple alteration which involves setting the length of the wire that attaches the float to the sender itself. The instructions give a number of different dimensions so it was just a case of working out what length my wire needed to be with a minimum tank depth of 295mm. Preferring to err on the side of caution (I want a zero fuel warning before its too late) I decided to use the shallowest point of the fuel tank when calculating the tank depth. This is 295mm. It is then a case of working out the correct length of wire from the chart. I calculated this as 227mm. The sender mechanism comes with two wires which have to be trimmed then held togther with clips which have to be welded in place. At this point, although I had a nice shiny new gas soldering iron I had no gas, so this was left on the bench and finished off today. Need to find out what size bolts are needed to attached the sender to the tank now and as soon as the fuel line fittings are sorted out the tank can go back in and were a lot closer to a first start.